discover this little gem! 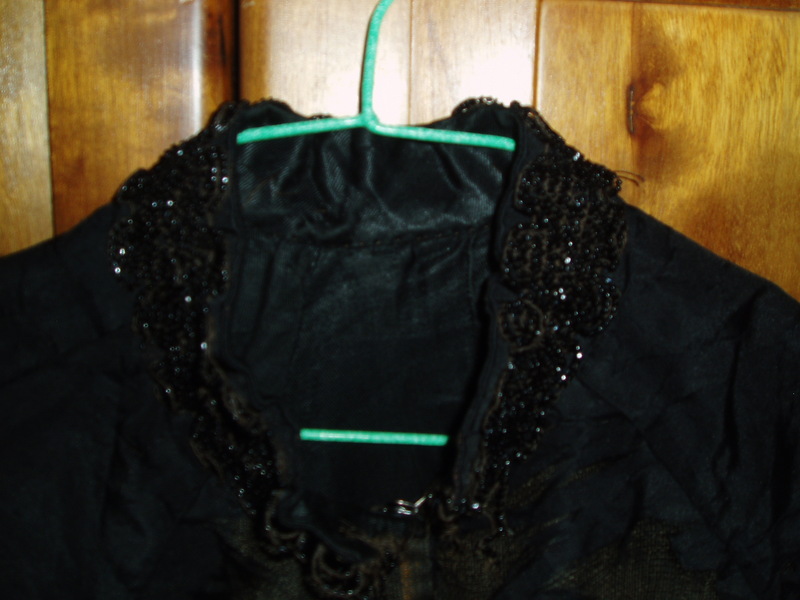 It’s a capelet that may be from Victorian or Edwardian times – maybe someone planned to take it on the Titanic voyage!!! (From the looks of it, maybe it went on the Titanic voyage). It’s so old that many theories and stories about it’s history could be possible. Some woman wore this covering her shoulders over a dress. It might have been an evening gown, a day-dress or mourning dress – maybe a costume specialist could tell. Manufactured trim with antique beads is sewn around the neck and the hem of the capelet. So many hand-stitches! As you can see, the outer layer of fabric is in tatters, but the black, silky lining is pristine. If the cape were flipped inside out, the beading trim removed and transferred to the other side with a replacement liner made it would be almost new again! Even though non-sewers might think so, it’s not a big job. Just amazing. I haven’t decided whether I will want to restore it and wear it, sell it to another collector or donate it to a theater or museum. As always, it just goes to show that – you just never know . . . . . . . . . .. So innocent and sweet! 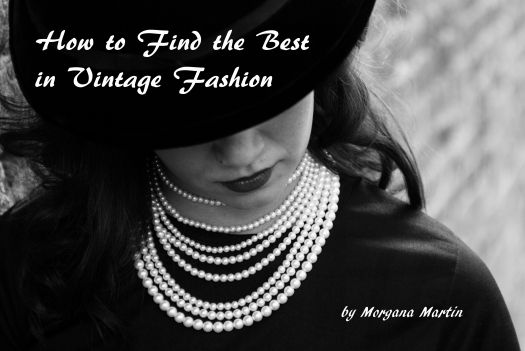 Fashions from the late Sixties and early Seventies were really into retro styles, from Edwardian, Victorian, Prairie to 1940’s. They’re fun and pretty, but sometimes too many buttons on long cuffs or front and back closures. Just like the real women of those times had to contend with. Anyway, for a blast from the past it’s worth it when I find an example from that time that’s so perfect. This one was maybe worn once and then was treasured and preserved for decades. How could I resist? Possibly this was custom-made though, if so, someone spent a lot of time on the ruffles, extra lining and putting in the little loops for each cuff button. However, at that time there were still lots of women and girls who did that kind of needlework happily and had the skills to create something as nice as would come from a store (even nicer than the things that come from stores today, sadly). But, regardless, this is a HAPPY DRESS and maybe someone will enjoy it for Prom again. You just never know . . . . . . . . . . . . . . . . . . . . .. So pretty – with signature 1980’s shoulder pads plus the Edwardian, Victorian elements that designer Jessica McLintock has always loved. Dark green crushed velvet makes this a Fall/Winter dress for a dressy occasion. Although it’s not way old or classic, I often like to pick up designs by Jessica McLintock that date 1985 or before. They are definitely of an “era” and well-made. This one will be fun to wear. JUST FOUND: LATE 1960’S CUSTOM-TAILORED SPECIAL OCCASION GOWN – HIPPIE PROM? This frock is sooo iconic late Sixties and in perfect condition! It’s Flower Power, British influence and Edwardian style. I’ll bet it was made for a Prom or Spring Fling dance. What a Blast from the Past!!! 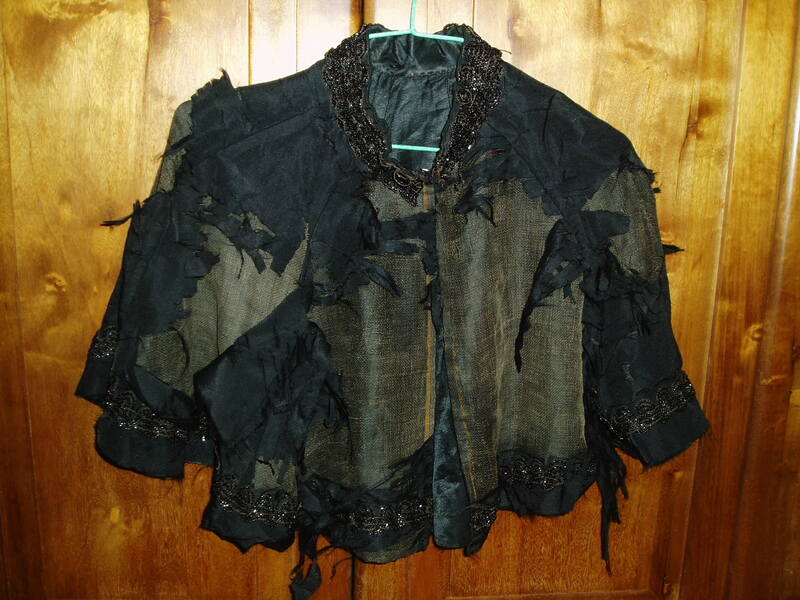 Look at the sequence of iridescent buttons at the sleeves and the ruffled flounces. Sheer flocked flower design over a pink liner. Back in the day, it was usual to hire a seamstress to make these types of dresses or to make them at home unless the high school was in an expensive neighborhood. It’s just so cute and tells such a typical story. It’s fun to know something about those times so that I can read the book very easily! Not sure what I’m going to do with this, but it was just too fun to pass up. It would make a really sweet short dress . . . . . . . . . . . . . TRUE VINTAGE VICTORIAN/PRAIRIE-STYLE GOWN FROM THE '60'S.